This entry was posted on Thursday, February 5th, 2009 at 10:55 pm	and is filed under In A World..., TeeVee. You can follow any responses to this entry through the RSS 2.0 feed. You can leave a response, or trackback from your own site. You realize that some one is now writing “A Shot at Love with Jack Harkeness” as I type, right? 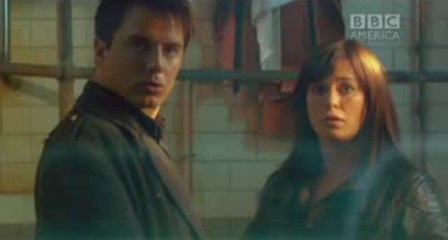 Torchwood seems to be written to ruin slashfickers days. There needs to be more splode in The Wood, so Gwen getting a face full of splode is fine by me, although it’s still not enough - they need some real guns, like they used in the big story in the last series of Who.